IzumoFS is a SDS (Software-Defined Storage) that designed to enable anyone to create massive scale-out NAS with amazing comfort. IzumoFS combines cutting-edge features such as In-Line Deduplication with ordinary file based data handling. The system is maximized for simplicity. There are no special node, nor controller server. It's designed to be pure P2P architecture that you can finish installation process in less than a minute. You don't need any gateway to use CIFS, NFS or iSCSI because it's all natively supported by all node. IzumoFS is a true “It Just Works” solution that you can get. Say goodbye to expensive appliance hardware dependent storages. 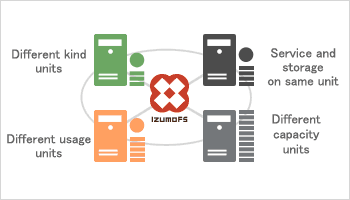 IzumoFS is complete SDS that runs on top of Linux with any commodity server. You are free to choose any kind of hardware you want including network. It is also possible to include your application as well, the hyper converged server. It will not only save your money by reducing number of machine but it gives better performance to whole system. IzumoFS is designed for today, the cloud and big data age. With its fundamental powerful technology it offers you stunning features which are not supported by solutions commonly available in the market. 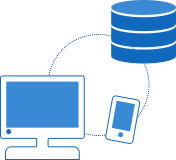 In-Line Deduplication, Native Multi-Protocol Support, Global Cluster Handling, Snapshot with Version Control, Inter-site Clustering, Cloud Backup, and features comes not only from functionalities but its architecture such as cache handling or memory management. By dividing the data into a certain number of shares, it becomes impossible to read a single byte of data from those shares and can be only restored when certain numbers of shares are obtained. 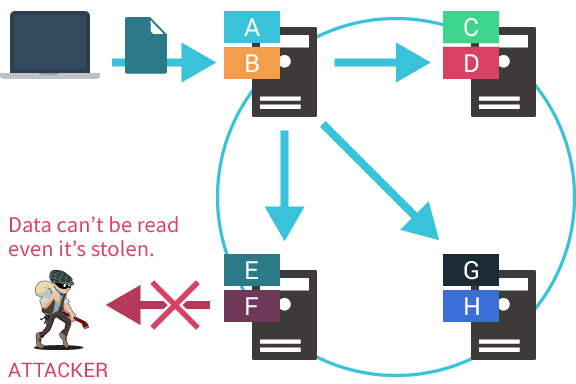 Secret Sharing Scheme differs from ordinary encryption that it doesn’t contain any “key”. Because full original data doesn’t exist within each share data can’t be read even it’s stolen. It’s very powerful method to protect your sensitive privacy data. The usual way of post-process deduplication is that the deduplication will be processed after saving, requiring the capacity to be temporarily increased dramatically. 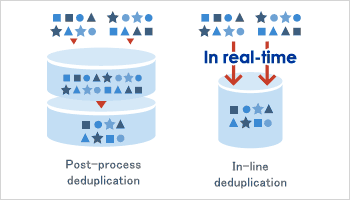 With the in-line deduplication on the other hand, the deduplication is performed in real-time while the data is saved, not requiring any temporary increasing of capacity. 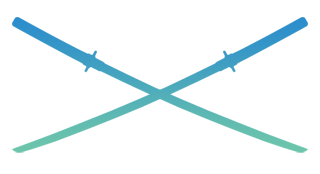 Furthermore, the in-line deduplication function enhances the cache hit rate, contributing to an improvement in reading performance. 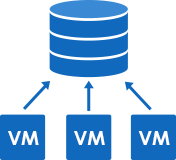 The storage can be configured through a number of different units and nodes connected at the same time, as well as through other systems, such as hypervisors or web servers, on the same units. As we can provide the software you can make use of any general purpose server that you already have. Through the CIFS/NFS protocols it can also be used as high capacity and availability in-house file server for companies. It can be configured as an external storage pool that holds the image of a virtual environment operating system. Supported by the iSCSI protocol it can be used with a general network setup. As content server for web services it will redundantly store high capacity contents, such as videos, images or music. 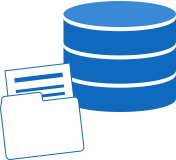 It is also suited well as storage space for extensive log files that keep growing over time.